a Delicious pita pocket recipe if you want a healthy breakfast that is ready in a snap and great to take with you. Heat a large frying pan and add the sliced bacon. Fry for 3 or 4 minutes until the bacon starts to brown. Add the mushrooms and the olive oil and stir through. When the mushrooms start to softenadd the tomatoes and red pepper/ jalapeno. Continue to fry until the mushrooms have softened and browned and put filling in separate bowl. Stir until the egg is cooked to taste. Add the bacon and mushroom filling to the egg mixture and stir through. 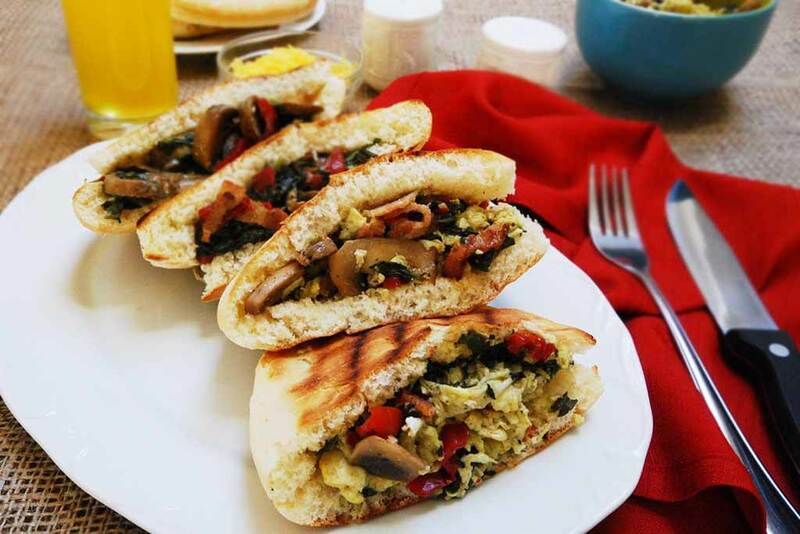 Slice open one side of each of the pitas, fill the pitas with the wholesome egg mixture and enjoy!